Ahh yoga class, the glow of the candles, the collective sound of OHM, the stinky sweaty scent on your mat…wait. A smelly yoga mat can totally ruin your one shot of the day to unwind. You want your mat to be so fresh and so clean but without all the chemicals. Namastay on your mat with Mat Mist. 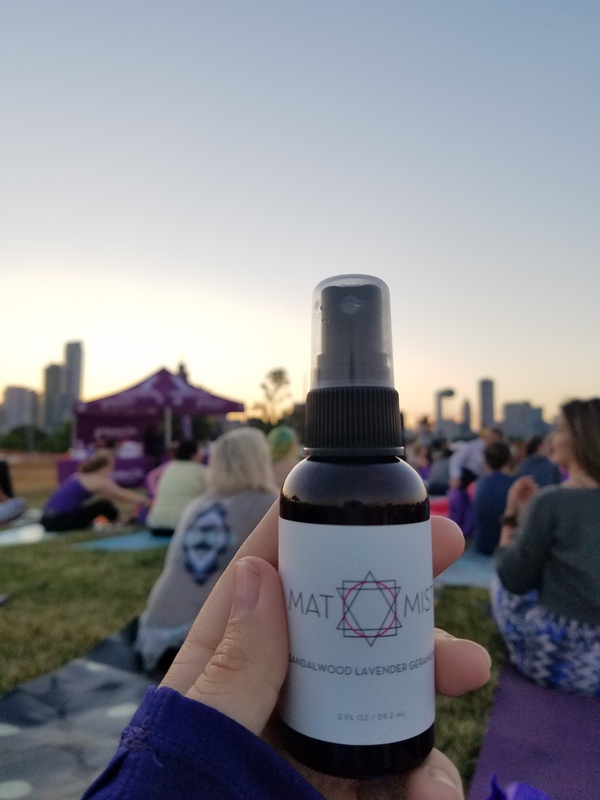 Mat Mist is a new aromatherapeutic, essential oil spray created by Brooklyn, N.Y.­based yogi, Cassie Cosgrove. Just spray it up, roll it up and your mat is good to go. We were offered 4 blends to spray after our Sun Salutations. Lavender Sandalwood Geranium: Calming lavender preps the chill atmosphere and sandalwood adds energy to your inversions. We like to use this as a bedroom spray for easier sleep. Thyme Douglas Fir: Get in touch with nature with the earthy scent of Fir. Lemon Myrtle Peppermint Vetiver: Fresh citrus and cooling mint can warm up a cool practice. Meditation: Breathe deep without the incense and make your home into a studio with this relaxing scent blend. Anti-Germies: Each of the essential oil combinations included in the line are known for their antibiotic, antiseptic, antifungal, and/or antiviral properties. All oils are therapeutic grade, distilled carefully to retain the plant constituents known for medicinal properties. Yoga Studio Friendly: Scents dissipate quickly to prevent you from being “that yogi” who perfumes the room. Multi-purpose: Use it as a room fresher, both in the air or on sheets or furniture. Cost: Mat Mist products are sold in a 2 ­ounce ($11) or four ­ounce (MSRP $18) spray bottle. Mat Mist also offers a subscription opportunity (MSRP $75/2oz or $108/4oz) where you receive new special ­edition mists seasonally throughout the year. Get fresh in your practice at matmist.com.